AMELIORATE Smoothing Body Exfoliant exfoliates, softens skin and smooths KP bumps while moisturising for up to 8 hours. Biodegradable Bamboo Granules and Alpha Hydroxy Therapy physically and chemically exfoliate above and below the skin’s surface while our unique LaH6 Skin Hydration Complex, combine with Shea and Cocoa Butters and Coconut Oil, to moisturise for up to 8 hours. Together with our unique LaH6 Skin Hydrating Complex, this highly effective formulation instantly sloughs away dead skin cells, hydrates and encourages new healthy cells to the surface. Skin is left feeling softer, smoother and healthier-looking. DIRECTIONS: Use 2-3 times weekly. Massage into DRY skin before showering or bathing. Leave on the skin for a few minutes to ensure the product works to its optimum before rinsing off. For progressive improvement in skin texture and condition follow with AMELIORATE Transforming Body Lotion. I have suffered with keratosis pilaris all of my life, and bought this skin smoother to go with the skin smoothing lotion. It is very nice to use and an excellent exfoliator. In conjunction with the smoothing lotion it banished my bumps within days. A lovely and effective product. 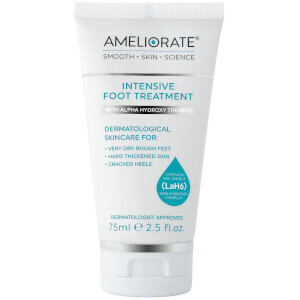 I have kreatosis pilaris since about 10 years and tested the other Ameliorate products so far. by now this is the best one I used and I can not only see but feel results. my skin is healthier, less red and feels so smoth! Lovely texture, gentle exfoliating experience. Applied a few minutes before showering lets it soften and condition the skin. Lovely.